The Osbournes on MTV has been described as the first reality-based situation comedy. Given the caliber of this show, that’s almost an insult. Reality TV conjures up images of bottom-feeding junk like Joe Millionaire, The Bachelorette, and, worst of all, the incredibly unwatchable The Anna Nicole Show. The Osbournes is unique among “reality” shows. It has more in common with the classic “mockumentary” This is Spinal Tap than it does with its reality TV brethren. By the end of the first season, all of which is included on this DVD, you feel like you’re part of a family living somewhere between the Partridges and the Sopranos. The series starts with the Osbournes moving into a new Beverly Hills mansion. The issues of the day include such mundane things as Ozzy trying to figure out the TV remote and DVD player. There’s also the issue of the Osbournes’ pampered pups and their knack for pooping anywhere and everywhere in the house. It’s clear early on that Sharon is the real brains and backbone of the family, never mind that she can’t figure out how to turn on the vacuum. She calls the shots, manages Ozzy’s career, swears like a drunken sailor, and shops like there’s no tomorrow. Jack and Kelly, at turns bratty and tender, can be grating, but they’re also grappling with the unfortunate disadvantage of being teenagers at the moment. Jack sloughs off his schoolwork in favor of hanging out ‘til 4 a.m., and Kelly can be a walking-talking ticking timebomb. They both swear like drunken sailors, but they still have something resembling a conscience. Cut them some slack. The biggest surprise is Ozzy himself. The self-proclaimed Prince of Darkness has a bark that’s far worse than his bite. As it turns out, he’s a good father, he’s a loving, doting husband, he loves his fans and his job, and he swears like a drunken sailor. Ozzy has some good lines, most of which can’t be quoted here. But it’s fun stuff when Ozzy starts yappin’ about how he’s not going to pick up another dog turd because he’s a rock star. Then there’s the nice moment when he explains to Kelly that he doesn’t ignore her — a lot of times he simply can’t hear her after spending most of his life standing in front of “30 billion decibels.” In the future, he jokes, she should just write him a note. One of the funniest revelations comes as the family goes to war with the neighbors. As it turns out, the Osbournes miss their old neighbor, Pat Boone. He was a great guy to have next door; the new neighbors are noisy assholes. Imagine that! With the family settling into the new mansion, Ozzy hits the gym and embarks on a promotional tour for his new album that then leads to a full-blown tour the likes of which haven’t been seen since, well, since Spinal Tap regrouped, very briefly, a couple years ago. After the tour, Ozzy’s back home for the holidays. And, just like in almost every household across America, the family members quickly get on each other’s nerves. Therein lies the show’s extra bit of edge. Deep down, it has heart and it is honest, at least from an MTV sensibility. The Osbournes probably have a greater sense of right and wrong than a lot of people are willing to give them credit for. Ozzy’s obviously getting a little tired of all the conversations that still lead back to his bat- and dove-biting days. Now looking at life through the purple haze of his peacenik spectacles, reminiscent of John Lennon, he’s hardly a saint, but he’s a good guy looking to keep the rock and roll alive. The DVD has two incarnations, one censored and one “totally” uncensored. Buyer beware, though. The uncensored version removes all the bleeping over the bad words (and that bleeping can be restored in one of the set’s options). But only the audio has been restored to its full “glory.” In this “uncensored” disc, each flip of the bird is still shrouded in a blur, along with Ozzy’s joking attempt at sticking one of his X-rays down the backside of Kelly’s gym pants. As a “bonus,” though, there is a clip of Ozzy mooning his fans in concert. No blur. Just pure crack. Set amidst an entertaining menu design featuring the Osbournes at home with their various electronic gadgets, the two-disc set is loaded with features. The best is a collection of one-on-one interviews with the Osbournes that offers a lot of insight into the family. The interviews do a nice job of putting the series into context. The first nine episodes offer a running commentary, but it’s only by Sharon and Jack. Their comments are pretty frivolous and unnecessary aside from a couple good observations and zingers. Also included are bonus footage and a “Too Oz for TV” blooper reel. Navigating through the bonus footage takes some work. There’s no “play all” option, so viewers have to go through scene by scene, episode by episode. That makes watching the unaired footage all the more tedious. The collection of extra scenes simply doesn’t add up to much, nor does the Season Highlights section. Ozzy’s Ten Commandments is a good joke, but not nearly as funny as might be expected. The Ozzy Translator is an option that can be turned on or off. It’s basically sporadic subtitles for when Ozzy’s jittery, British-accent-on-drugs gets a little hard to understand. However, there are times when he’s hard to follow and no subtitles are offered and other times when the subtitles don’t entirely match what he’s saying. The subtitles are also regularly accompanied by cutesy graphics to help get the point across. There are a couple of set-top games that can be played on a standard DVD player. Name That Dookie challenges players to guess which Osbourne dog created the pictured dog poop. It’s totally crude, but funny. Edit A Scene is a novelty that allows players to stitch together an assortment of scenes in the order of their liking. That one’s no big deal. 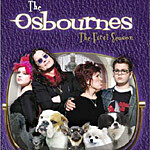 The first episode contains A Guide to the Osbournes, which is kind of like Pop-up Video with a collection of facts and trivia presented on screen during the episode. The first episode is well done, but the disappointing part is the content for the other episodes is available only online. That over-reliance on the Web is ultimately the biggest fault of the supplemental materials. It is misleading to promote so much DVD-ROM content that in actuality is merely a link to the Internet. All of the Web-based material should have, and could have, been included directly on the DVDs. Included in this Web-based menu of DVD-ROM features is the Food Nuisance game, which allows players to throw common household items like ham and wood at the annoying neighbors. You have one minute to do as much damage as possible before the police arrive and whisk you away. Play it once or twice and then forget about it. There’s also a DVD Bingo game, compatible with five of the episodes and played much like a drinking game. Each time an icon appears on screen, players check off the matching icon on their Bingo card. First with four in a row wins, naturally. Once again, though, the DVD Bingo cards are downloaded off the Web. Rounding out the package are a photo gallery and a booklet with Entertainment Weekly’s review of the series and rules for playing DVD Bingo. English captions and French subtitles are also on hand. One thing not included that would have made the set complete is the original MTV Cribs episode that served as the launching pad for this series. Straight from cable TV to DVD, the picture is fine and the audio is presented in Dolby Digital Surround, which takes full effect when Ozzy’s doing his thing and when Jack’s hanging out at the clubs on schoolnights. Overall, the DVD is a hoot for Ozzy’s fans as well as those who enjoy the vicarious thrill of living with a rockstar. It’s also at least worth a rental for the curious and those who think nothing good has come out of MTV since the days of Martha Quinn. However, those with sensitive ears might want to stay away, at least from the uncensored cut.